David Nash, GM Nutrition & Quality Equine Nutritionist BARASTOC (Ridley) For a horse owner the prospect of having a horse with colic is a terrifying event. It could be a mild case of an uncomplicated colic to a life threatening large colon torsion. In first instances we do not know the degree of threat to our horse and there are many “wives tales”, on how to treat your horse. From my non veterinary perspective we had always had the theory, if in doubt “GET THE VET”. The equine digestive tract is quite a complicated system with nearly 30 meters of twists and turns and a capacity of around 220L which all has to fit within the horses’ body cavity. You can now see how colic and digestion problems can occur if we are not feeding correctly. Back to Nature This term gets thrown around with abandon in the equine world but to a nutritionist it is all about matching the diet with what the equine digestive tract has evolved to consume. This means a high roughage (fibre) diet fed in small frequent meals (grazing). 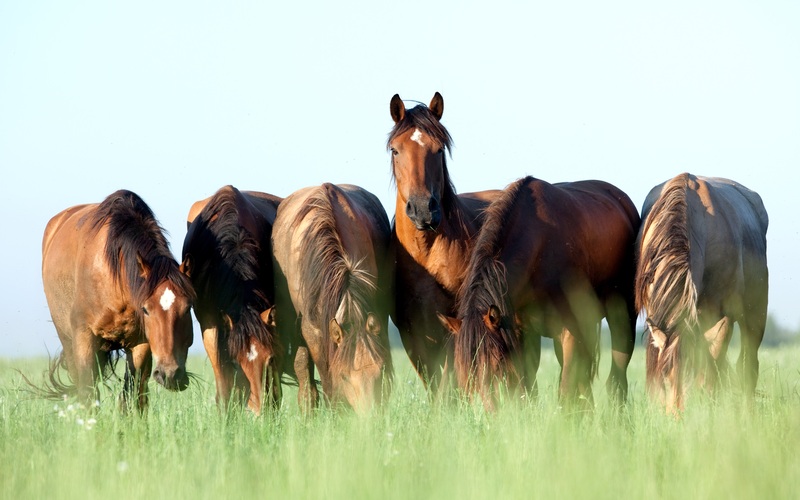 Remember, horses on pasture will graze between 16-18 hours a day. This allows for a constant and steady passage of feed through the digestive tract and little sudden variances in nutrition source. This allows the digestive tract and the bacterial population in the horse’s hind gut to maintain some sort of “stasis” and as a result reduces the risk of colic. Horses should receive the vast majority of the diet as a roughage source. 1.5-2.0% of their bodyweight per day should be adequate. That is 7.5 – 10kg dry matter of feed per day for a 500kg horse. Most equestrian horses will derive most of their energy and protein requirements from their roughage sources. All they will need to do is balance their vitamin and mineral requirements and match the remaining energy and protein requirements with some supplementary feeding. If your horse requires more energy supplementing with super fibres and feeds high in fat will reduce the risk of complications associated with high grain diets. Ask you nutritionist for assistance. Quality of forage sources is always a concern. Musty and mouldy feed should be avoided at all costs. If you are purchasing hay from a fodder store simple return the feed as the risk of colic from poor quality feed potentially containing mycotoxins is too great. Hydration – Water the first limiting nutrient “Water is the key to life”. Horses like all mammals are comprised mainly of water. If we lose too much water from our bodies, complications with digestive tract motility will occur. An average horse will consume 40 to 50L of water per day with a lot of this water required in the hind gut to assist in hind gut fermentation. As horses increase their work load or the temperature increases horses will sweat. This will increase their water requirement. If horses loose too much electrolytes it will affect their thirst response and horse will not replace water lost and will dehydrate. This will dramatically increase the risk of impaction colic as the horse will draw water from the digesting feed within the horses’ digestive tract to assist the body with its hydration requirements. It is important for horses to have access to clean cool water at all times to ensure water consumption is encouraged. If your horse is at risk of colic and the roughage sources is dry and low in moisture it is extremely important to ensure water is readily available. A few tips to improved water intake is to feed a high fibre diet as a rule of thumb is for every 1kg of roughage eaten a horse will drink 3kg of water. To assist further you can dampen your feed with water to reduce dust and increase water intake as well as soak your hay. This also has the benefits of reducing the sugar levels of your hay and the horses’ total diet. Free choice salt added to their feed or salt blocks will also encourage water intake. Digestive Tract Assistance Horses that may have suffered from or are at risk of colic may have a negatively altered bacterial population in the hind gut. To get the horse on the road to recovery or the try and keep the equine gut bacteria a healthy as possible we may look at supplementing the horse with Pre and Probiotics. These ingredients will help promote a healthy digestive tract by maintaining a constant ideal pH within the hind gut which will support beneficial bacteria and assist in the repair of damaged tissues. Horses with healthy bacteria populations will have an increased appetite and will be less at risk of digestive upsets that can lead to episodes of colic. New research has also shown that some of these products can also bind to harmful pathogenic bacteria and be excreted in the horses’ manure thus reducing the risk of these bacteria. Summary To conclude this brief discussion on feeding horses susceptible of colic the key take home points are to encourage a most natural diet as possible which is high in quality and well maintained forage. Ensure the horse is well hydrated and that strategies are taken to encourage the horse to consume water. Gut health maintenance is a key factor in reducing the risk but also assist in recovery from colic episodes. Pre and Probiotics can assist in combination with high roughage diets in promoting a healthy bacterial population in the horse’s hindgut. If you are ever in doubt of your horses diet or health status please consult your nutritionist or veterinarian.